Weighing system: it’s installed on the feeder’s inclined part, thus allowing the constant control of the quantity of material supplied to the plant. The system guarantees high accuracy and has already been tested on apron feeders. Outflow concentrator: as known, the outlet width of the surface feeder is about 2,6m. 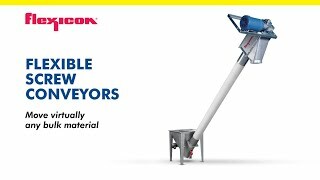 The following conveyor might have a narrower inlet (for example in case of a bucket elevator); in this case, in order to grant an efficient flow of the material, a certain vertical distance must be provided among the outlet and the inlet of the two conveyors. Nevertheless, this vertical distance can be strongly reduced by the introduction of our outflow concentrator, thus driving the flux in the center of the feeder outlet. Sizer/breaker at the outlet of the surface feeder: the supplied material might have to be reduced in dimensions. In order to do this, a sizer can be installed on the outlet. Roller screen: installed on the outlet, it allows to eliminate the small size material from the flow; additional breakers and rollers are capable to separate further foreign materials as well. With the above mentioned accessories the surface feeder becomes a very efficient and complete unit, able to receive the material from trucks or loaders, weigh it, reduce it to the right size and eliminating small size material and even foreign stuff , while conveying. These new successful features of the surface feeder allowed Gambarotta Gschwendt to sell numerous units to some important Chinese companies.